"It is something I am considering. Any time you have a realistic opportunity to make South Dakota better, you have to take a look," Dusty Johnson says. "The thing for me: Can you be a good congressman and a good father?"and... "I have tremendous respect for Rep. Herseth Sandlin, but this is not about her. It is tough to sit on the sidelines as we deal with security and economic issues. It would be an opportunity for me to make a difference," Johnson said. Rep. Joel Dykstra is opening the door to a possible U.S. Senate campaign regardless of what Johnson decides to do.Read it all here. I got in the paper. And it wasn't even for a traffic violation. Todd Epp, a Harrisburg lawyer who publishes the liberal SD Watch blog, was one of the first to interview Jeff Gannon of Talon News, who reported Tom Daschle’s Washington D.C. citizenship; Gannon was later found to have pictures of himself naked appearing on a homosexual Web site. Pat Powers, who lives in Brookings and has been active in Republican politics for years, runs the conservative South Dakota War College blog. Powers has been ahead of the curve on a number of breaking stories, including the incident concerning state Sen. Dan Sutton last year. Sparks sometimes fly between the liberal Clean Cut Kid blog and conservative Sibby Online. Chad Schuldt, who publishes CCK, has worked for Sens. Tim Johnson and Tom Daschle in the past. Al Gore: Americans need to switch to compact fluorescent light bulbs. 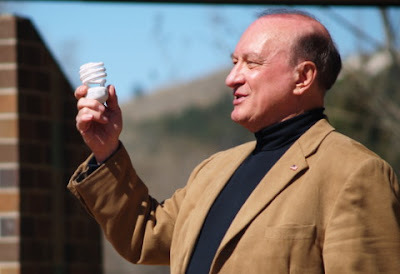 Earth Day 2007: Tom Katus promotes compact fluorescent light bulbs. Sheryl Crow: "We can make it work with only one square per restroom visit." NOOO!! I don't even want to think about it! Hundreds of thousands of dollars have been stolen from the Westward Ho Country Club, and the club is now trying to get the money back. A longtime employee is accused of taking the money, club officials state in court documents obtained by the Argus Leader. Club officials accuse their former office worker and general manager, Nancy Frerichs, of making off with the money during the past several years. Frerichs has not been charged with any crimes. The allegations against her are contained in a lawsuit filed against her by the country club, near Sherman Park on Sioux Falls' west side.Read it all here and tomorrow in the Argus Leader. Yes, that's a paid advertisement. So please go visit the website. The Sam Kooiker campaign was nice enough to buy an ad here to promote his website which was just fired up for public view. 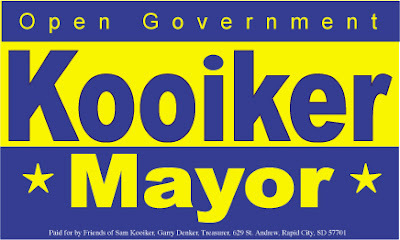 So take a moment to go over and visit www.samkooiker.com to learn more about the candidate. Governor Mike Rounds continues to stress that he likes being Governor just fine. Rounds has been mentioned as a possible U.S. Senate candidate in 2008, which would be in the middle of his second term as Governor. Rounds, who has always said he has no interest in running for the Senate, says he is focusing on his job as Governor. At this point, Rounds says he doesn’t foresee a situation that would compel him to run for Senate.Read it all here. I was doing some "stuff" recently which allowed me to get some pictures of some unbelievable South Dakota political items - things I've never seen before. And being a sharing person, I thought I'd share the experience with you. There are a lot of harsh political pins out there in the McGovern Era - but this is by far the harshest. "Acid - Amnesty - Appeasement - Vote McGovern." Yow. This is the first time I've run across this rarity. Sen. Tim Johnson wasn’t at Monday’s meeting of Iraq War spending conferees, but his signature was. “When they passed the signature sheets around on the conference report, he had already signed,” said an aide who attended the meeting. How Johnson’s signature got there remains something of a mystery. Johnson spokeswoman Julianne Fisher claimed no knowledge of the signature’s existence, even after the conference had closed. “He’ll sign it by the time he needs to sign it,” she wrote in an e-mail. I was just starting to do some research on the Secretary of State's website for something I'm working on, and I noticed a couple of things. First off - They have a motto now. Maybe I just missed it before, but I'm noticing tonight. "Rising above your expectation with excellent customer service through friendly, knowledgeable, and responsive personal assistance." But that didn't grab me as much as the next thing I came across as I was looking up some voter registration statistics. For some odd reason, they have a degree of kinship charthere. I think this is a more recent addition. I'm assuming it's so people can look at the chart and figure out if they're allowed unlimited donations or exempt from other campaign finance laws based on their "degree of relativity." That's got to be it. Angela Nielsen of the South Dakota GOP has announced that it's time for a change. This Finance Director of the South Dakota Republican Party for about 5 years has decided to pack up her ledger book and try something else. Well, not that new. Angi has taken a position as Finance Director of the Republican Party of Minnesota. Angela - congratulations on your new position, thanks for all your hard work, and good luck at your new position from the SDWC. We hope to be reading about you again soon. Hunt, a long-time anti-abortion activist, has said the person is a South Dakota resident who wants to remain anonymous out of fear of possible violence. The state says Hunt's corporation must identify the person, but Hunt argues it's not a ballot question committee and is not required to file campaign finance reports. Read it all here. Not passing judgment on the morality of it, but given the state of South Dakota's previous campaign finance laws, I think it is entirely possible that Roger was within the law to do it in the manner he did. Look what I found in my stuff. 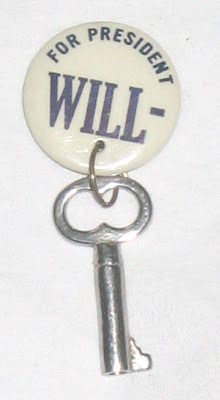 A Wendell Willkie political pin. I was cleaning out some boxes I had brought over to Brookings this weekend, and unexpectedly came across this gem of a political pin in my stuff. In fact, I'd forgotten I even had it. The picture doesn't do it justice, as it's nearly perfect in every way. This pin comes from the 1940 presidential election of Wendell Willkie against FDR. South Dakota was one of 10 states that Willkie carried. I kept it pinned to my shirt all day so I wouldn't misplace it, and as I took it off tonight, I thought I'd share a picture of it. For those collectors among you, you can generally find this pin for about $20.00 or less. After taking Saturday completely off from blogging, and doing my household chores inside at the Brookings headquarters of the SDWC earlier today, I'm back on-line! The big event of my weekend was the Codington County Lincoln Day Dinner on Friday night. It was a great opportunity, because from my experiences that evening, I learned three things. If I hadn't tried some correction (gamma correction was cranked way up) on them, they might as well have been a picture of a black lab in a cave at midnight. Considering I had the best seat I've had at most any Lincoln Day Dinner I've ever attended, the bad photography is even more inexcusable on my part.